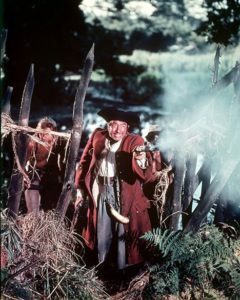 Walt Disney liked to adapt classic tales that were well-known (and copyright-free), so when he decided to make his first live-action feature, it’s not surprising that he chose Robert Louis Stevenson’s Treasure Island, with its child protagonist and adventures in exotic locales. What is surprising is how hard-edged and gritty it is, considering Disney’s later (well-earned) reputation for peddling bland conformist mediocrity. This 1950 film is as tense and dynamic as its pre-Code 1934 predecessor, and just as closely adapted from the novel, though the exact choice of scenes and dialogue varies between the two. Moreover the Disney version, of course, is in vibrant full color. Though the Disney film’s Billy Bones, Squire Trelawney, Dr. Livesy, and Captain Smollett can’t match up to their earlier incarnations, Bobby Driscoll as young Jim Hawkins does well, and is far less grating than the saccharine Jackie Cooper. And as good as Wallace Beery was as Long John Silver—and he was very good indeed—Robert Newton in the Disney version simply blows him away. He is Stevenson’s consummate con man in the flesh, all deference and false humility, constantly letting the mask slip just enough to show the audience the calculating schemer behind the smile—a trick he learned from Beery, to be sure, but Newton perfects it. Plus, the broad West-Country accent he adopts as Silver has become the default talk-like-a-pirate voice of piratical rogues ever since. You can blame Newton for “Ahr,” which he slips in everywhere; at the end of a funeral prayer for a man he’s murdered, he even solemnly intones, “Ahr-men.” And with a wink, you know the mutiny will soon be on. The film was shot almost entirely on location in Cornwall and the tropics, and it looks great, including the background matte paintings of Bristol Port and a distant Hispaniola run aground on Treasure Island’s shore. Speaking of the Hispaniola, the ship plays such an important rôle in the plot that in any adaptation of Stevenson’s tale it’s practically a member of the cast, and for this version they’ve got a fine square-rigged three-master that’s completely persuasive. The most important decision in the novel, and the most intense scene in the film, is when Jim Hawkins decides to leave the safety of the stockade and go alone to cut the Hispaniola adrift, which leads to the nightmarish pursuit of the lad across the darkened deck and up into the rigging by the deranged and murderous pirate Israel Hands (Geoffrey Keen). It’s the emotional climax of the movie, and after Jim wins through single-handed, there’s no doubt but that in the end the ragtag pirates will be no match for young Hawkins and the forces of right and decency, no matter how John Silver plies his deceitful silver tongue.